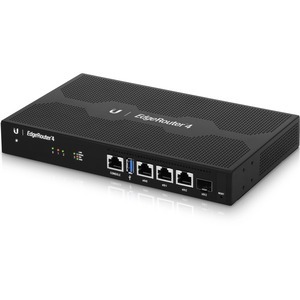 Ubiquiti Networks introduces the EdgeRouter™ 4, the next generation of router for the EdgeMAX®platform. EdgeRouters combine carrierclass reliability with enterpriselevel features in a compact and affordable unit. The EdgeRouter 4 offers Gigabit Ethernet ports and an SFP port for a fiber link. The EdgeRouter 4 is capable of routing up to 3.4 million packets per second and has a line rate of 4 Gbps. Powered by a proprietary and intuitive graphical interface, EdgeOS®, EdgeRouters can easily be configured for routing, security, and management features required to efficiently run your network. For advanced network professionals, an integrated CLI is available for quick and direct access using familiar commands. DHCP Server Set up multiple DHCP servers to assign IP ranges in different subnets on the different interfaces. Easily control dynamic and static IP addressing for your network devices.